Does your child like messy play? Does he dig right in and get started? Or is he hesitant and reluctant to get his hands messy? Messy sensory play can be a delight for the senses! Some children seek it and some avoid it. 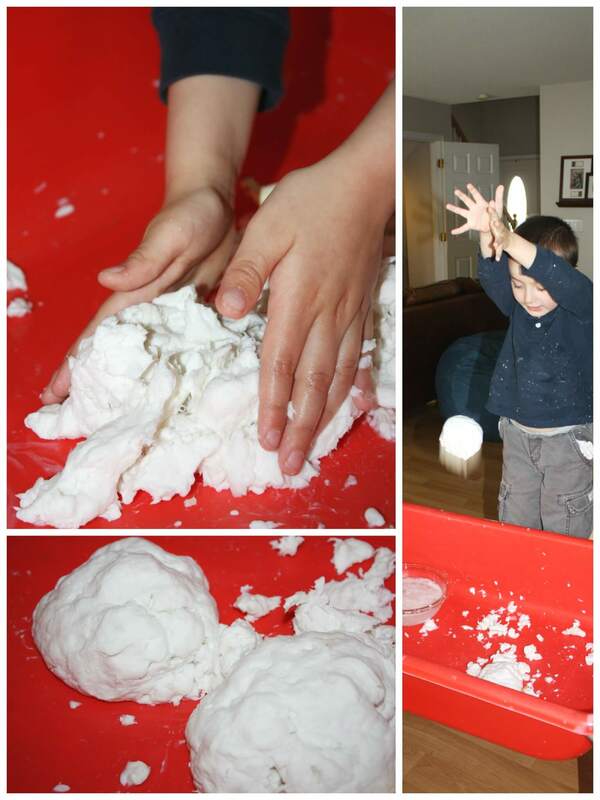 Keep experimenting, respect boundaries but also continue to try to find messy sensory play that works for your child. 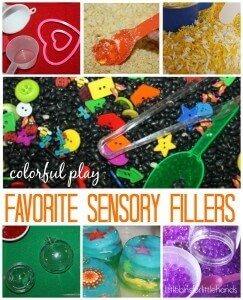 Spend time trying out different sensory play ideas. The first one might fail and the second one might be perfect! 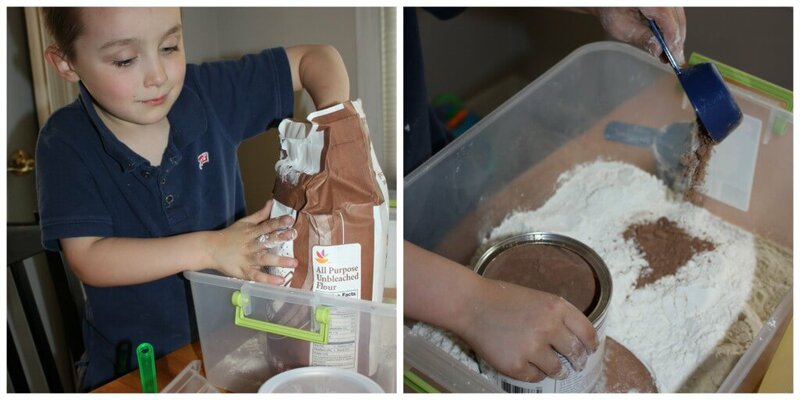 I thought it might be fun to spend the week trying ideas or experimenting with messy sensory play recipes. Some are versions of ones we have tried in the past and some are brand new, even edible. However, they are all easy to set up and inexpensive to try. 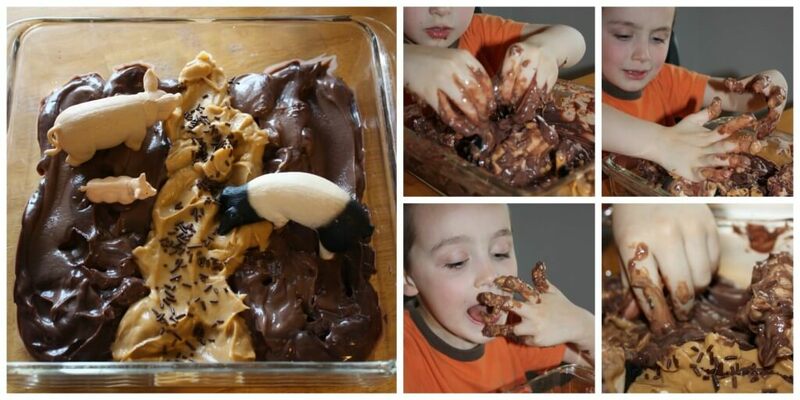 You may even have some of the ingredients for this great messy sensory play already on hand! Take a look and dig in for some messy fun. Messy Sensory Play Tip: Keep towels and a bowl of water near by. 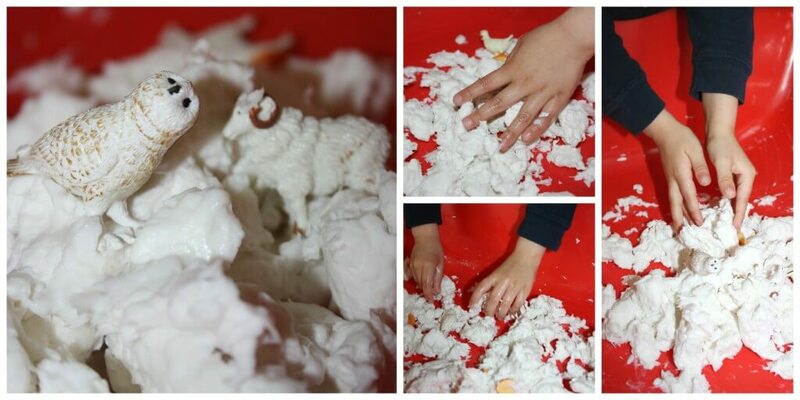 This messy sensory play is easy to make! I did not measure anything but simply mixed until it felt right. I saved two days worth of coffee grounds (wet) for this. If you don’t drink coffee, try scenting with cinnamon and vanilla or maybe cocoa powder would work too! I put some baking soda in a baking dish and added the grounds. Because the grounds were also wet I did not add any water, they still had enough moisture to form a messy but pack-able dough that easily crumbled. Otherwise, you would need to add a bit of water to get the desired consistency. I added some little scoops, a chopstick and his farm animals! I love how he started to dig in and get a little messy! I found him a small cup to mold little castles for the animals. Having a few tools ready can help a reluctant child enjoy messy sensory play. I first saw this over at Happy Hooligans as ghost mud but it is also called clean mud which is perfect for our “muddy” sensory play. I will send you over there for detailed instructions (very simple really). The best part is ripping up a roll of toilet paper! This was definitely messy sensory play, but he appeared to be having a blast. I think he enjoyed making “snow” balls and plopping them into the bin. Note: you might want a large bin for this messy sensory play! 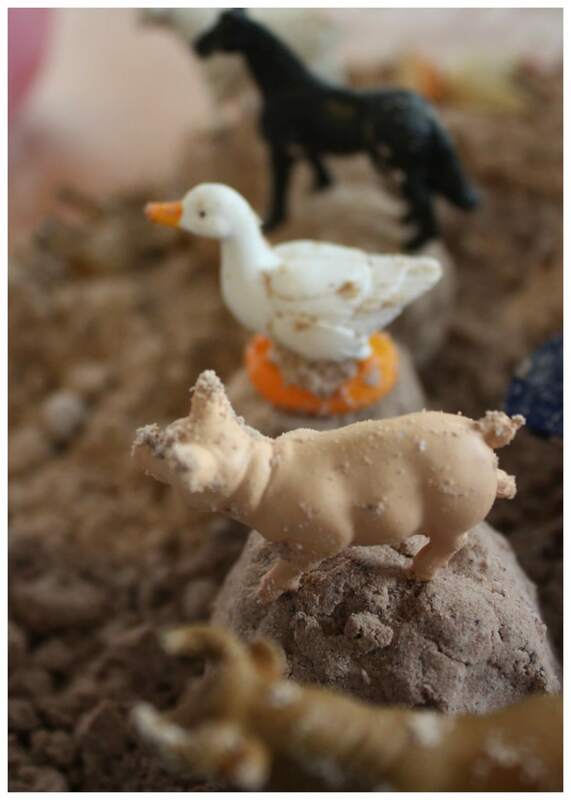 I was so inspired by my blogging friend over at House of Burke with her messy edible piggy play that I thought I would try it out on Liam too. I was hoping a special treat to taste might encourage greater participation and enjoyment. Of course! He made a pig pile and gave them a mud bath. There was some finger licking going on too. (I did save a bowl for dessert later). We have done a few cloud dough sensory bins this year already! So easy to make with flour and oil. I usually mix a few cups of flour with 1/2 cup of vegetable oil or any oil you have on hand. Not super tasty but nothing bad if swallowed either. Since I wanted to make it ” muddy” cloud dough, I switched out a cup of flour with a cup of cocoa roughly! More Homemade Cloud Dough Recipes To Try. 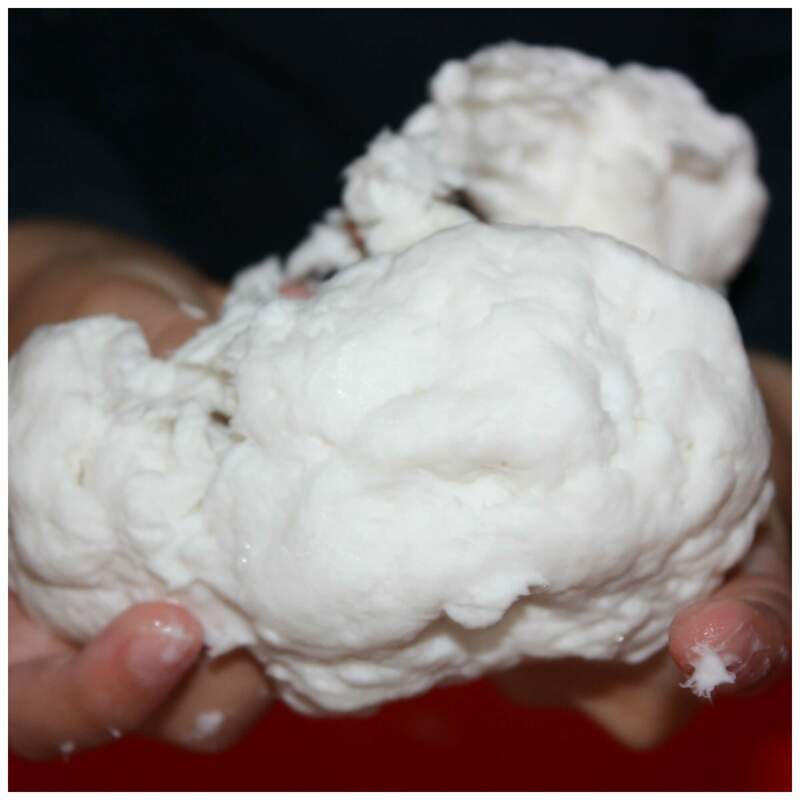 Cloud dough is a fun messy play experience that isn’t to messy as long as someone else does the mixing. Some messy sensory play ideas are a bit less messy if they are prepared beforehand. Cloud dough is also great for molding and making castles but we made little mountains this time! 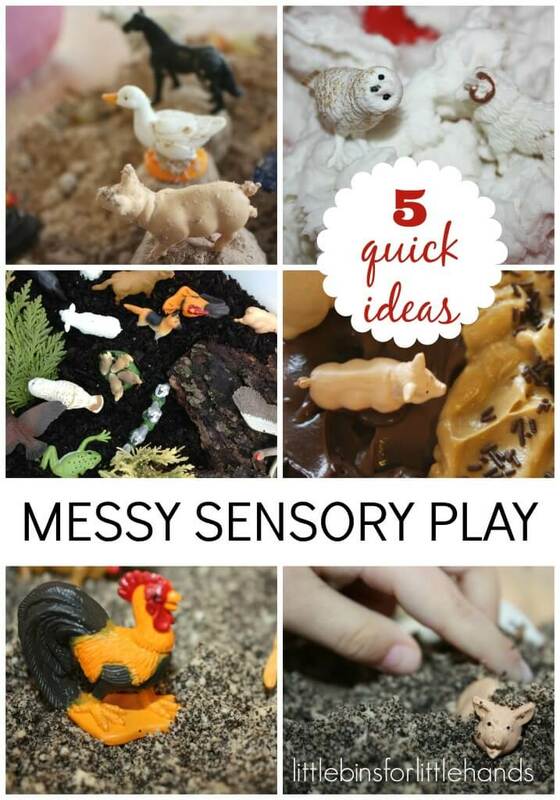 Dig up some dirt for this messy sensory play idea. This is a pretty simple idea but it is still messy fun! Gather natural elements from around the yard to add to your dirt bin. Get ready to make some mud! Messy sensory play gets even messier. Watch out the flood is coming! Save the animals! A Successful Week Of Messy Play For All! 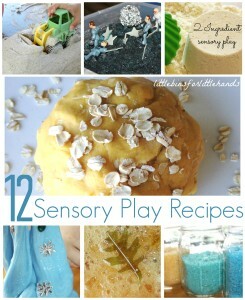 Check out more sensory play resources, click photos! So much messy, muddy fun! I just love the ideas you shared here – I’ll be trying some out this summer, I’m sure. So many fun ways to explore and get a bit messy! I keep wanting to try the clean mud one with my little guy…. Maybe this weekend! 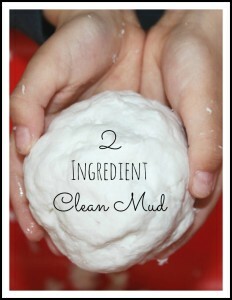 The “clean mud” one is easier than I thought to make! But my daughter would love any one of these ideas!